Starring: Guy Pearce, Maggie Grace, Peter Stormare, Lennie James, Vincent Regan, Joseph Gilgun. Written by: James Mather, Stephen St. Leger and (also based on his original idea) Luc Besson. For every known reason to man, I should hate Lockout. It doesn’t have an original thought in its body, the special effects look cheap and clumsy, there are so many plot holes and its utterly contrived. Yet, for some inexplicable reason it was possibly the most entertaining piece of junk I have seen since Taken. I think a lot of it has to do with the two leads, Guy Pearce and Maggie Grace. Set in the future, where a new prison has been set up, in space. Harden criminals, murderers and rapists, are now sent to this high security space station where they are cryogenically frozen. The President’s daughter, Emilie Warnock, heads to inspect the prison for humanitarian reasons. While interviewing one of the prisoners, the deranged Hydell, he manages to escape and releases all the other prisoners, including his brother, the more intellectual Alex, who then captures the station, hostages and all, including Emilie. Meanwhile, ex CIA agent Snow, is being wrongly held on espionage charges as well as murder. He is given the opportunity of freedom if he goes into the prison single-handedly and bring back the President’s daughter alive. It also gives him the chance to clear his name. So up into space goes Snow but it is never going to be an easy journey. Now, if you know cinema, you are looking at that synopsis and instantly you are saying, sounds like a cross between Die Hard and Escape From New York. You would be right. In fact, name any action/sci-fi film from the past 30 years and you will see elements here. That is because (and this is the funny bit) as the credits say “based on an original idea by Luc Besson” is one of the biggest jokes of the film. There is absolutely nothing original about this film. There should be a competition for viewers to try and name the films it so blatantly is ripping off. Even Star Wars is there. Having said all that, it doesn’t matter a jot. It just adds to the fun of watching this total time waster. 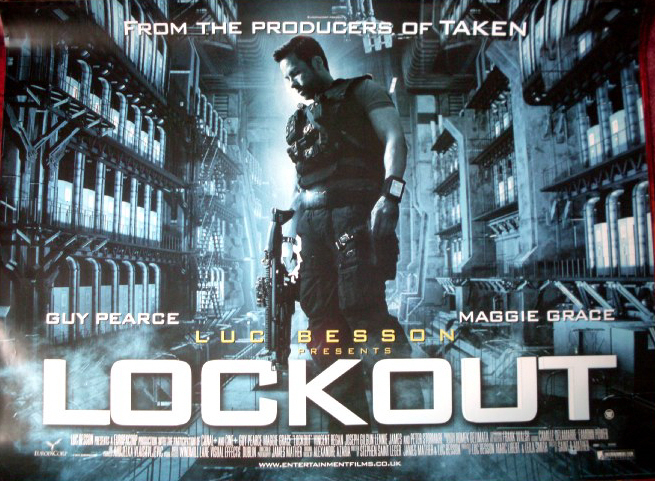 Besson has been responsible for quite a few guilty pleasures over the years, none more so than the 2008 surprise hit, Taken (let’s ignore the dreadful, cash-cow sequel for the time being). What worked for that film, no matter how unoriginal it was, is that you get someone with charisma in the lead and the rest will take care of itself. Here we have Guy Pearce. Not normally associated with action films, Pearce is playing a wise-cracking, smoking loner who doesn’t care what kind of beating he gets, he will always have the last laugh. The type of character Bruce Willis can play with his eyes shut and hands tied behind his back. A bold move for an actor who normally plays straight in dramas. The thing is, it works. He does it very well. It also helps that he gets someone to spar with in the shape of the usually token female Maggie Grace (and if you don’t know who she is, she’s Liam Neeson’s daughter in the Taken films). It’s this pairing that the film works brilliantly. The one-liners and quips thrown out by the two are genuinely funny and the chemistry works well. They both know this is garbage and play it with their tongues rammed in their cheeks, lifting the whole experience from z-grade fodder to really entertaining. Also helping it along the way are two very unique baddies. Vincent Regan and Joseph Gilgun are perfectly suited as the warring brother Alex and Hydell and making them Scottish (never explained but why not) makes a change from the usual bad guy stereotypes. Gilgun is especially good as the sociopath and is only this close to going into pantomime villain, if he wasn’t so violent. I ignored this on its initial cinema release on the grounds that it only lasted a week and I didn’t think it was going to be any good. I was so wrong. It is terrible. Yet it is terrible in the same way that The Cannonball Run is terrible, or Taken is terrible, or anything that Jason Statham is terrible. You just sit back, don’t think, don’t emote just go with the nonsense and enjoy the ride. Frankly, I was shocked at how much I enjoyed it. It’s a hoot.